Please wear warm clothing and winter boots. This exciting activity near the Lyngen Alps is the perfect choice for those who want to explore more and experience wild nature and Northern Norway at their best. The tour starts with a scenic drive between mountains and wild nature with fantastic views of the majestic Lyngen Alps. On arrival at our secret gem, you will be provided with snowshoes and shown how to use them. Using snowshoes and poles, we hike up to one of the smaller summits. You will be rewarded with breath-taking views of the majestic surrounding mountains – if only the weather allows us to see them. We stop several times during the hike for rest, to participate in snow activities, take photos and provide you with information about our region and the Arctic environment. 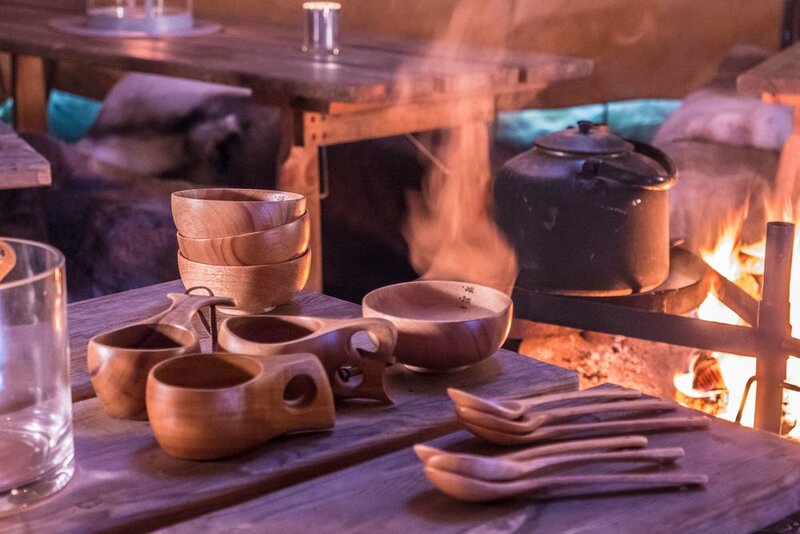 During the longest break, we visit a Sami camp and share some Sami history. While here, we serve hot drinks and you can taste local lamb and salmon. This tour is not suitable for guests with a heart condition or restricted physical ability. Please bring warm clothes and winter boots. 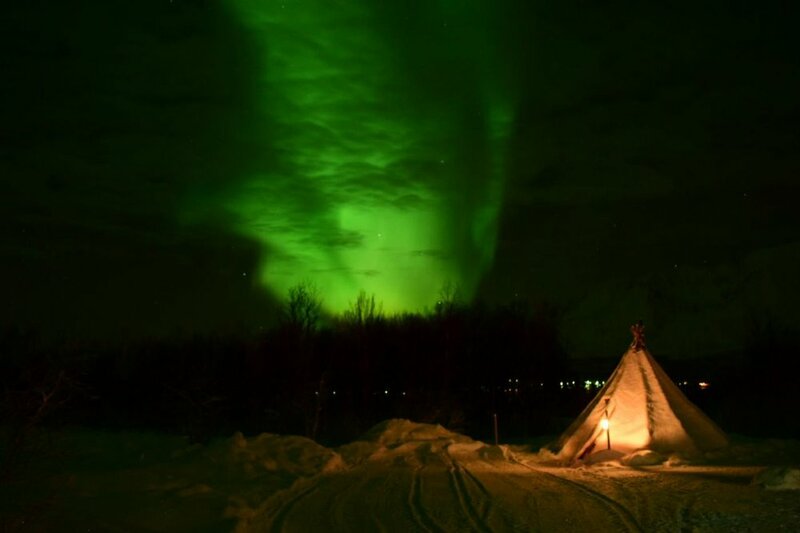 We would like to offer you Tromsø’s best kept secret consisting of the best North Norwegian hospitality and warmth at the end of the road where the scenery is at its wildest and best, and where the chances of seeing the Northern Lights are always good. Why follow the others, when the best place is to be found where few have been before? We invite you on a journey through some of the best scenery in Northern Norway – picturesque valleys, majestic mountains and pristine fjords – to our secret gem, where you will be welcomed by the best views of the Lyngen Alps. 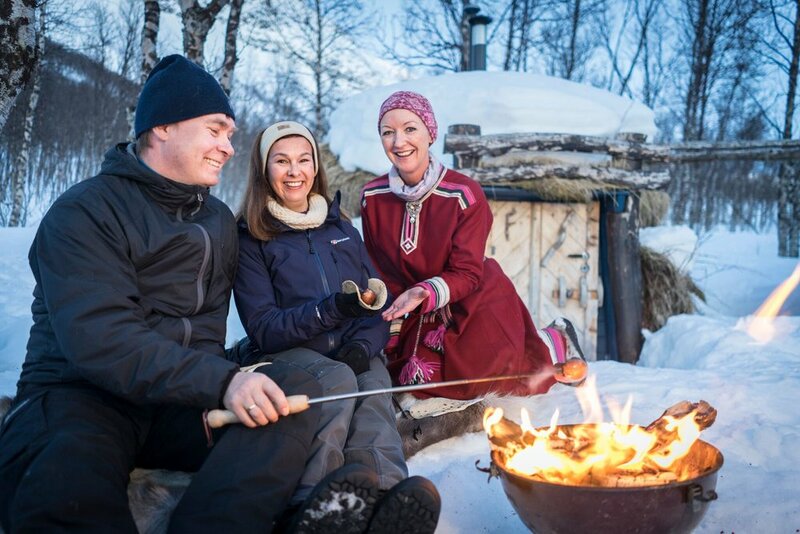 Tromsø’s best host will be waiting to greet you and share a memorable evening combining local food, cosiness, an evening walk on snowshoes and fascinating stories about the Sami culture and Northern Norway. This special place well off the beaten track and has very little light pollution since few people live here, and a wide sky view where the Lyngen Alps act as a backdrop. With a heated shelter and the whole evening at your disposal, we could claim to have the best place near Tromsø for the Northern Lights. Welcome to our best kept secret. On our Ice Fishing tour, you will be able to take part in one of the most loved winter activities of the north. The tour starts with a scenic drive between mountains and wild nature. At the end of the road, you will have the best view of the majestic Lyngen Alps. Not far away from Tromsø in a hidden valley and fjord, you will find an Arctic paradise that remains largely untouched. This is where we offer you Tromsø’s best kept secret, consisting of the best North Norwegian hospitality and warmth at the end of the road, where the scenery is at its wildest and best. We equip ourselves with an ice drill and ice fishing gear and head out on the frozen lake surrounded by wild and breath-taking nature. We drill a hole in the ice and wait patiently for the fish to bite, while gazing into the hole, removing ice and letting our thoughts wonder. Dress warmly so you have the best possible change to spend a long time on the ice. Even if the fish are not biting, this is sure to be a fascinating experience. We serve hot drinks and snacks during your visit. This is a great choice for those who want to explore more and experience wild nature, culture and North Norwegian elements at their best on a frozen lake in the middle of almost nowhere.